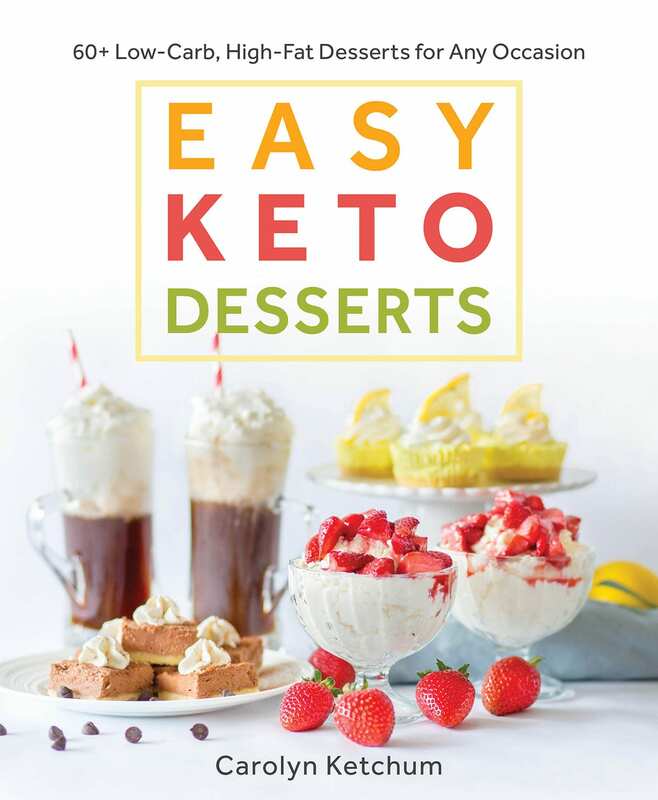 Boston Cream Pie gets a keto makeover! I recently updated this low carb recipe and now it’s even better than before, with fewer carbs. Tender almond flour cake filled with sugar free vanilla pastry cream and a rich low carb chocolate glaze. I lived in the Boston area for over 11 years and the first time I ever tried this classic cake was when I made my own low carb version, way back in October of 2011. Given that it’s the city’s official dessert (according to the ever reliable Wikipedia), it’s quite astonishing that I never gave this delicious dessert the time of day. Don’t make the same mistake I did, my friends! Make this Boston Cream Pie recipe as soon as you can and you will be ever so glad you did. Is it a pie or a cake? If you’ve ever been to Boston, you will know just how confusing that city it, with its meandering avenues and lack of good street signs. Possibly you even asked someone for directions and got quite turned around, trying to make sense of their multi-step instructions. Believe me when I say that driving around that town is not for the faint of heart. Any of you who have ever driven on Storrow Drive know exactly what I am talking about! Well, in keeping with the Bostonian way of making things confusing, Boston Cream Pie isn’t a pie at all, but really a cake. A cake filled with vanilla pastry cream and topped with chocolate. Okay, so it may seem like they are deliberately trying to confound outsiders with improper names and poor street signage, but when it comes to dessert, Bostonians aren’t messing around! You can’t really go wrong with a custard-filled cake topped with luscious chocolate ganache. Now that I’ve made my own and tasted it, it’s quite shocking I never did it before. 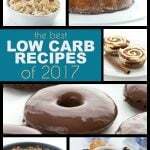 My original low carb recipe was at the request of a reader, wayyyyyyy back in 2011. Boy that seems like a long long time ago! Even back then, I was pretty deft at low carb baking and it was relatively easy to figure out how to make over this classic cake and reduce the sugar and carbs. But over the past 7 years, I have honed my keto baking skills , so it was time to tackle a little update. For one thing, the cornstarch in the vanilla pastry cream had to go. 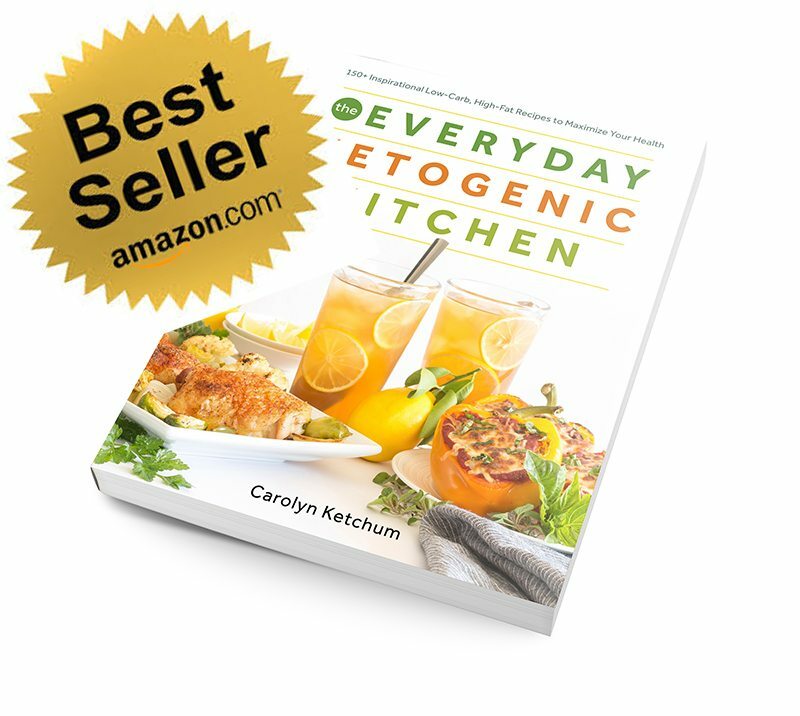 That is not something I use at all anymore and I’ve found that xanthan gum or glucomannan work much better as a keto thickener. I also added an extra egg yolk to help thicken the cream filling. But I still found it a bit on the goopy side so I whisked in just a touch of coconut flour so that it didn’t ooze out too much between my cake layers. You may find you don’t need it, depending on how well your pastry cream thickens up. I reduced the carbs in the cake layers as well, by using my standard vanilla cake recipe but by subbing out one of the cups of almond flour for a 1/3 cup of coconut flour. Next up I tackled the glaze. I used to make a chocolate glaze that was based in butter but I’ve found that I can actually make a really good keto chocolate ganache the traditional way, by simmering cream and then melting the chocolate in the cream. Of course I can’t use chocolate with sugar, so I use unsweetened chocolate and whisk in a little sweetener at the end. The thickness of your chocolate glaze will depend a little on the brand of cocoa powder you use (I used Rodelle). This is why I’ve also added instructions for thinning or thickening the glaze as necessary. The truth is that the updated Boston Cream Pie recipe and the old version are both really good and they taste about the same. They both have a creamy center and a rich chocolate glaze. And oh, is there anything prettier than chocolate ganache dripping down the sides of a cake? I think not! But this new recipe is simpler and more straightforward. And it skips the icky ingredients like cornstarch, so you know this will fit in well with your keto diet. I took this to a friend’s house for an end-of-summer barbecue and it was devoured by everyone! You know it’s good when even the non-low carbers give it rave reviews. 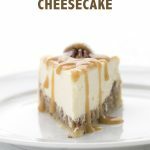 Looking for more delicious keto cake recipes? 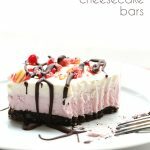 Check out my page of Keto Desserts here! 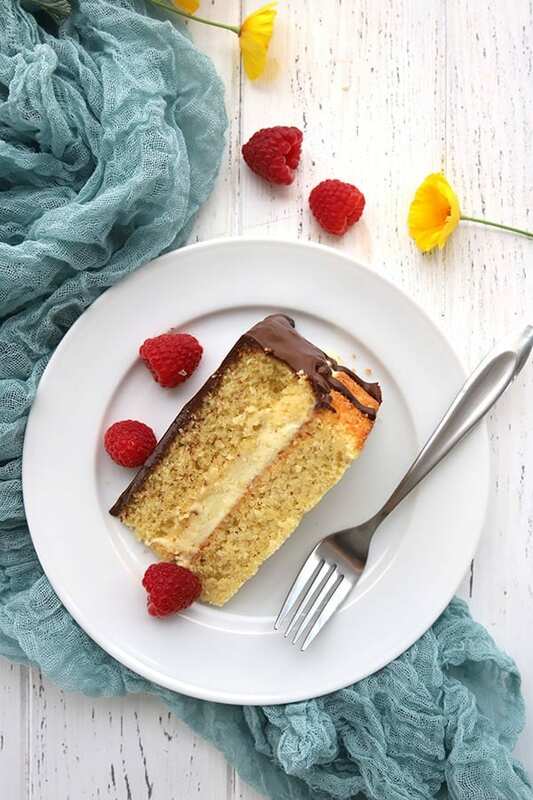 Boston Cream Pie gets a keto makeover! I recently updated this low carb recipe and now it's even better than before, with fewer carbs. Tender almond flour cake filled with sugar free vanilla pastry cream and a rich low carb chocolate glaze. Bring the whipping cream to a simmer in a medium saucepan over medium heat. In a medium bowl, whisk the egg yolks with the sweetener and salt until well combined. Slowly whisk about half of the hot cream into the yolks to temper, then slowly return the yolk/cream mixture back to the saucepan and cook until thickened, about 4 to 5 minutes, whisking continuously. It thickens up very suddenly and quickly, so watch it carefully! Remove from heat and whisk in the butter and vanilla extract. Sprinkle the surface with xanthan gum, whisking as you go, to combine well. Let cool to room temperature and then refrigerate at least 3 hours. For the cake, preheat the oven to 350F. Grease 2 (two) 8-inch round cake pans and line with parchment paper. Then grease the paper as well. 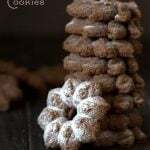 In a medium bowl, whisk together the almond flour, sweetener, coconut flour, protein powder, baking powder, and salt, breaking up any clumps with the back of a fork. Stir in the eggs, melted butter, and vanilla extract until well combined. Stir in just enough water so that the batter is spreadable but not pourable. Divide the batter evenly between the prepared baking pans and spread to the edges. Bake 20 to 25 minutes minutes or until edges are golden brown and the top is just firm to the touch. Cool in the pan 10 minutes and then flip out onto a wire rack to cool completely. In a small saucepan over medium heat, bring the whipping cream to a simmer. Remove from heat and add the chopped chocolate. Let sit 3 to 4 minutes to melt. Add the powdered sweetener, cocoa powder, and vanilla and whisk until smooth. Let cool 5 to 10 minutes, while assembling cake, until the glaze is thicker but still pourable. If it's too thick, gently re-warm with an additional tablespoon or two of cream. If it's too thin, whisk in another tablespoon of cocoa powder until smooth. Whisk the chilled pastry cream briskly to remove any clumps. If you find it's very gooey and likely to ooze out between the layers of cake, whisk in a bit of sifted coconut flour to help thicken it. Place one layer of cake on serving dish and spread with the pastry cream. Gently top with the second layer. 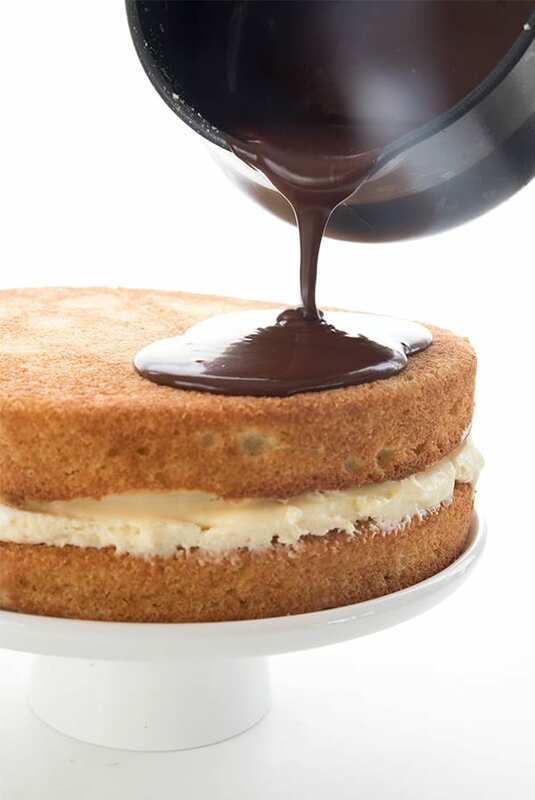 Pour the chocolate glaze over the top of the cake and spread with a knife or offset spatula, pushing to the edges and letting it drip down over the sides. Pour the chocolate glaze over the top of the cake and spread with a knife or offset spatula, pushing to the edges and letting it drip down over the sides. Refrigerate the cake 1 hour before serving. The old low carb Boston Cream Pie. Looks pretty good even for an old old recipe! I am the guilty party who requested this, and thank YOU so much. I can't wait to make it. Yum. I love Boston Cream Pie so so much. Yours looks wonderful! love the second picture! so pretty. I've made a cupcake version but never the traditional/original version. I should really get on that. I like cupcake idea, how do you do that please. Thank you. Oh my my my … Oh I would love to have one piece of this pie, it looks insanely delicious!! Haven't heard of that brand of eggs-appreciate the share. Bless you, Allison, for requesting this. Wow, wow, wow. I'm not even gluten or carb anything, but I'll be giving this a go. This looks so good! Boston Cream is one my favourites. 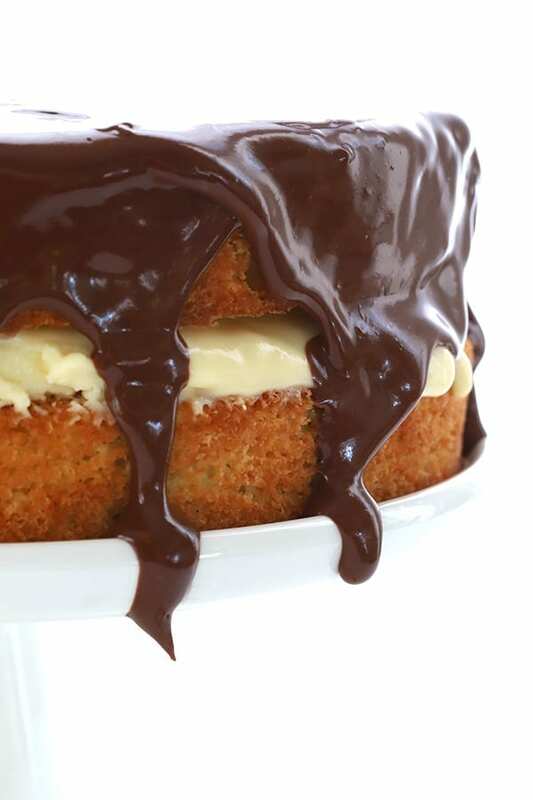 Love the ganache dripping down the side in your photos! Wow, Carolyn. This looks amazing! I'm sure so many who are gluten free appreciate this! This looks so good & yummy…..Thanks for sharing. I'll bet that tastes as good as it looks! This cake looks great, but I kind of just want to take a spoon to that glaze! I don't think I've ever had authentic Boston Cream Pie, but yours looks like the perfect low carb one. The cake looks really good – wouldn't guess it was made with just almond flour. You definitely don't need to tell me that this is good. Boston Cream is one of my favorite things. Whether it be a donut, cake, cupcake…you name it and I will eat it if it says "Boston Creame". Your cake looks positively sinful. That ganache and the cream…::swoons:: heaven. Oh my. I love the photo of chocolate being drizzled… beautiful shot! I've been to Boston just once but never had Boston Cream Pie. Looks delicious! Love this cake, err pie. My favourite donut (even though I don't eat them very often) is Boston Cream so I can only imagine how good this would taste!! Oh. Wow. That dripping chocolate is drool worthy! Yes please! I have actually never tried Boston Cream Pie. I am really going to have to change that soon, this looks amazing! Yes, you didn't need to mention that it was good. Your photos say it all. As a die-hard New Yorker who lives in MN – it's just funny where life takes you. Oh my! I've never been to Boston, but if this is the official dessert, I think I need to book a flight ASAP! This is absolutely stunning and gorgeous! Okay, it's final. I need to move down the street from you so I can "pop by" when I smell stuff like this cooking. This is just stunning Carolyn. I am so impressed. Great cream pie! Fabulous photos! I love Boston! Great shopping and food! This "pie" looks delicious! You did a great job! I love all that chocolate dripping down the sides! I love talking to my friends about Boston – it is a whole other great north east city that stands out on it's own. I can't believe you had never tried this cake yet!!! I can't imagine a family get together where someone doesn't bring some version of it. Your Boston cream pie looks like it would hit the spot with a nice cup of caffeine right now. Get me to Boston! Or your place! This is SO GORGEOUS Carolyn!!! Wow – looks too pretty to eat! Thank you for this delish creation. I can't wait to try it, only my cholesterol is high,can you please suggest alternatives for whipping cream and egg yolks in pastry cream? 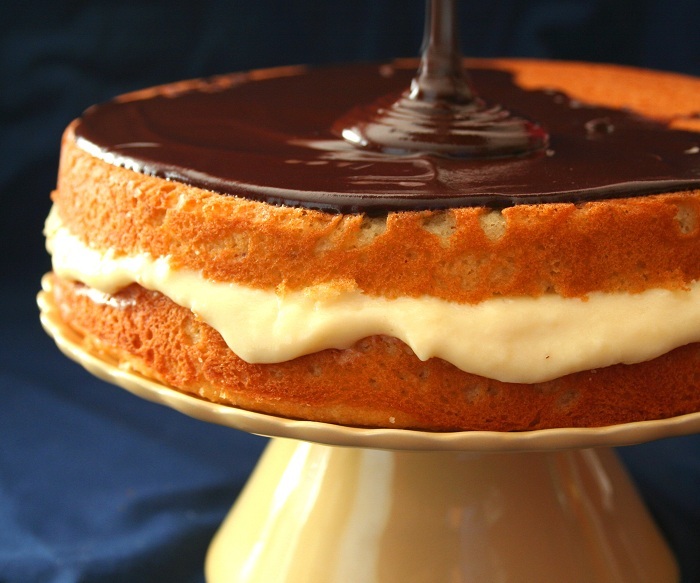 I d love to try your boston cream pie recipe, it looks very delicious. I could't think if I actualy ever tried or baked an american pie recipe. Looks good, I'll have to try it soon. What a fun & fancy pie! That dripping chocolate is fabulous! This looks amazing!! 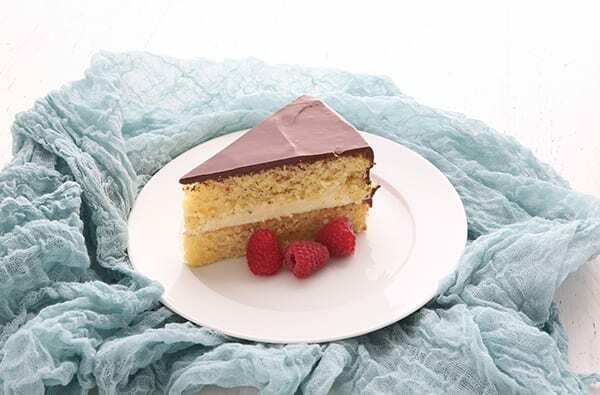 I love Boston Cream Pie – delicious and elegant. Beautiful photos! The cake recipe is similar to what I use to make shortcake, so I bet it's good. This is sure something I want to try! Absolutely delicious! Thanks for sharing. Congrats, Carolyn! Your Boston Cream Pie made this week's "Top 10 Most Popular as voted by the Knapkins Community" Let's eat some Pie!! Your Pie looks utterly delicious. Its great to have found your blog. Hello Carolyn, I need help!!!! I tried to make the cake. It turned out like a heavy semisweet bread with a gummy texture. Is the amount of xantham gum correct at 1 tsp.? As soon as it hit the other ingredients, the batter crawled up the beaters and almost out of my bowl!! The batter was very hard to spread into the baking dish and turned out ugly and lumpy on top. I've messed this up somewhere. Can you think of what I've done wrong? Wow, okay, I am not sure. yes, 1 teaspoon xanthan is correct and that's definitely not the issue here, because that's what I use in ALL my cake recipes and I've never had this issue. Did you alternate adding half the almond flour with the almond milk, and then add the second half? Something seems off here, like you had too much dry ingredients to wet, because the batter should not be that thick, but I don't know why. It just makes me think that some wet ingredient was missing. What kind of almond flour did you use? And if this happens again, add more almond milk, by the tablespoon, until you have a more spreadable batter. My bubbie made this for me today for my b’day and he had similar problems. I think it’s the variation in flours. Some are higher in fibre to total carb ratio that others and that seems to make a huge difference in how quickly the moisture gets taken up. Higher fibre, lower net carb, but also takes up the moisture like a wick. He also had a hard time spreading the batter. But the custard is amazing and while the cake fell when taken out of the over, so it is very very dense, it is also very very tasty! 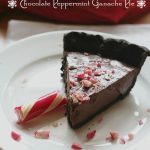 I’d change up the ganache in the future as I found it bitter and heavy, and am thinking I would probably add more sweetener and some heavy cream to thin it out(?) for the next time I make this. Yes, even though there were woes in making, it IS a wonderful cake and we WILL be making this again! Just a bit of a learning curve to low carb baking 😉 Thanks for the wonderful recipes and all your hard work, Carolyn! Carolyn – Thank you. We have tried 7 recipes this week in anticipation of my son’s upcoming birthday, and this is by far the best yellow cake recipe. I have a question, though. Have you ever tried replacing the yogurt with sour cream? Just wondering since that would lower carb counts a smidge. With the baking soda, I read that it tempers the “sour” of the sour cream, so I do not think it would alter the taste much. I think sour cream would do just fine. What’s the protein count on the same amount of sour cream as the yogurt? Perhaps a little lower, but I think it would still give it good structure. I chose this for my two year-old’s birthday, and It. Was. Amazing. I have never liked Boston Cream Pie, so I thought making this would help to keep me from polishing it off after everybody went to bed, but not really. I didn’t bargain on how delicious it would be. (I’m still sticking to my diet, but it’s now torture instead of easy–at least until my husband finises the third left in the fridge. He declared this “Winner, winner, chicken dinner,” which is an accolade really difficult to get from him. I liked it warm (the pastry cream, another thing I never thought I liked, is to die for), but the glaze was a little overwhelming. Cold, however, the chocolate flavor calms down and stops crowding out the lovely cream and mildly sweet vanilla cake. It’s like a giant donut, and I’m in love. Thank you. Now my second son is turning four in December–wonder what I’ll make for him . . .? LOL, winner winner, chicken dinner! That gave me a good giggle. Thank you! Do you think you could use something other than corn starch in the pastry cream? Would xantham gum work? I have the same question about replacing the corn starch- would “thick it up” work? It is a mix of gums. Thanks! Oh boy, no idea. YOu’d have to experiment. Is it a mix of xanthan and guar gum? If so, make the custard the normal way and then put in a 1/4 tsp of the gum, whisk briskly to mix and let cool a bit. If it’s not quite thick enough, you’d need to add more, maybe 1/8 tsp at a time. Just following up! I made almond flour pancakes this morning, and layered them with this pastry cream and chocolate ganache. UMM YES! I highly recommend trying it! Hi !!!! i’ going to make the cake but with lemon curd and italian meringue for tomorrow!!! i was wondering if I can replace whey proteine by more almonde flour???? The whey protein makes up for the lack of gluten (which is a protein). More almond flour won’t necessarily make it rise properly, but you can certainly try. Thank !!!! What can I use instead of protein ??? Corn starch or arrow-root or potatoe starch or coconut???? I am not sure any starches will help it rise. Try a bit of one of them (maybe a tbsp) and then add some extra leavening agent…maybe another tsp of baking powder? I can’t guarantee it! 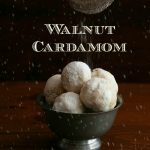 So many low carb recipes use almond flour, but I’m allergic to almonds…..what would you suggest as a substitution? I know it would be an entirely different recipe to swap coconut flour, but how about another nut flour, or sunflower seeds? This looks heavenly!! Is it only almonds you are allergic to? I have a great cake that is made with hazelnut meal…you could try that although you’d probably still taste the hazelnuts a bit. As far as I know….in trying to reduce my levels of inflammation (just doing low carb/gluten free wasn’t doing it. No surprise, since I reacted highly to almonds, & I’d been doing almond milk, flour…) I’m doing a pretty regimented food testing process. Every now & then I take a day off & thought this looked soooo good. I haven’t tested hazelnuts yet. I will do them soon now! Thanks!! I’m out of powdered swerve. For the ganache do you think it would be better to powder my own in my coffee grinder or use more stevia? Also, this recipe is about 2 1/2 yes old. Is there anything you know now that you didn’t know then that would make this recipe better? I finally got the powdered Swerve & made this. It’s FANTASTIC! Kept my dessert addicted diabetic mother (& me) happy for a week! Well maybe not an entire week, but close! 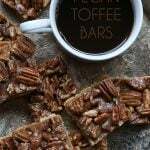 Thanks for helping me show my mother that quality desserts can be made without sugar or flour. No, the protein powder in my recipes is critical in making the cake rise and hold its shape. You can use powdered egg whites, though. 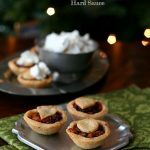 Would meringue powder be ok? I had company that I had never met before coming to our place for dinner (some of our S-I-L’s family), and I usually NEVER make a recipe for the first time serving company.. BUT this looked so fabulous I gave it a whirl and I’m so glad I did.. it is seriously DELICIOUS, moist, rich, chocolatey .. all the YUMS you want in a fabulously ‘show off’ desert! Thank you soooooo much for creating this and your instructions are super easy to follow. The Boston Cream is simply elegantly excellent, the cake is moist and not so sweet that it competes with the Boston Cream which graduates your taste buds to the Chocolate Topping!! I made this cake and it was absolutely wonderful. I will definitely make it again. My family had no idea it was sugar free until I told them. They were amazed! I had some trouble with the ganache. It was too hard. Not sure what I did wrong, but will add more cream next time I make it. In spite of the hard ganache, it was a success! Thanks for this recipe! Yes, that should be fine. I almost always use arrowroot starch now. thanks so very much. forgot, as to the Greek yogurt required in the cake, I regularly eat Fage 2% Greek yogurt. Did you mean the 2%, or is it the full fat or is it the 0%. Excited to prepare this! Full fat if you can get it but otherwise 2% is fine. hopefully last question, I won’t the Honeyville Almond Flour I ordered in time to prep the cake, but I do have Bob’s Redmill Almond Meal/Flour on hand. I know generally you say that Bob’s is only appropriate for muffins and quick breads, but in the instance of the Boston Cream Pie do you this Bob’s will work, or is it an absolute no? It’s not an absolute no, but your cake may not rise as much and won’t quite have as fine a crumb – but it will work and will taste great. Hi! I was wondering if you had any idea how you would go about using sugar in the cake? You will want about 1/3 cup in the pastry cream and 1/2 to 3/4 cup in the cake. Then for the ganache, about 1/4 cup powdered sugar. Thank you for your quick response! The pastry cream came out amazing last night. I will finish the cake tonight and let you know how it turns out! Your desserts are sublime. 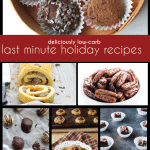 I loved this and high five for the low carb pastry cream…no easy feat! 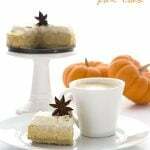 I’d like to use the cake and pastry cream for a low carb version of a layered gateau St. Tropez, flavoring one layer of creme pat with fleur d’orange and one with almond. As the St. Tropes is light, I’d like to try and and mix your creme pat with whipped cream to make it a bit airier. Kind of like a creme mousseline but without the uncooked butter. Do you think this would work? And if so, at what stage would you recommend adding in the whip cream? PS: I so enjoyed your Just Desserts (Kits) story from the Nanaimo Bar post. I have happy early dessert memories from there too! I’ve never heard of a Gateau St. Tropez but it sounds phenomenal. I think you don’t want to mix the pastry cream with whipped cream until it cools completely, otherwise your whipped cream will just melt into a gooey mess. I made this for my birthday! It came out delicious, but I messed up the baking a bit. A few questions for troubleshooting, please! 1. When I used the called for amounts of liquid to make the batter, it came out super thick and stretchy (xanthan, whey) like silly putty/bread dough. I added like another 1/2 cup of almond milk to make it more like cake batter. Please add photos of the batter consistency – with low carb baking I find it very hard to know what it should look like without process photos 🙂 I love your recipe writing, it is very clear, but batter photos would help immensely. 2. I used a 9″ pan and baked at 350 convection for 30 minutes – it got quite brown on the outside and the tester came out moist but clean, so I took it out. It fell and wasn’t thick enough (3/4in) to slice in half, so I had to half it crosswise and stack it. It was very wet inside, like bread pudding. Should I reduce to 325 convection and bake longer? I also could tell I didn’t thicken the pastry cream long enough, that I can fix – I was nervous due to failed hollandaise so I pulled it too fast 🙂 Also, my chocolate glaze hardened into… chocolate shell after being in the fridge, making it impossible to slice the cake, LOL! Should I add some heavy cream to it to prevent this? Thanks for the lovely recipes as always!! Carolyn, I made this cake as part of our St. Patrick’s dinner and hubby’s b’day party celebration. It was wonderful. Everyone loved it. Thank you for sharing. Love your site, your photos, your recipes…coming from someone that has a million food allergies. 🙂 One question, if I wanted to try to sub the 6oz of greek yogurt in the cake, any recommendations (outside of another kind of yogurt). If I used 3oz of non-dairy milk of some sort would it “react” and work the same or would I need to add something else due to the yogurt causing a certain reaction element that I would be missing? (I hope that makes sense). Thank you for being amazing! Use the thick coconut cream off the top of a can of coconut milk. That should work well. Any chance you’d have an idea how much Sweet Blend to use for the Pastry Cream? Should I just sub out the equivalent to the Erythritol, or the Stevia Drops too? I just ran out of Ery., but have the Sweet Blend and Vanilla Creme stevia drops. Advice?! My recipe equates to about 1/2 cup sugar (including both the erythritol and the stevia) so use 2 to 3 tbsp Sweet Blend to match that. I usually use Ghirardelli. But next time, I now suggest using my chocolate ganache recipe instead. Try the one from my Death By Chocolate Cheesecake recipe and do use a better quality chocolate. Thank you, we definitely will. This looks delicious!! 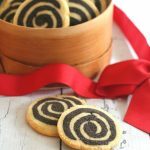 Could the THM baking blend be substituted for the almond flour? Yes, but you want a little less of it because it’s drier. I love Boston cream anything! . I’m going to try and make this into a trifle. I have a flat bottom trifle bowl that round cakes fit in perfectly. 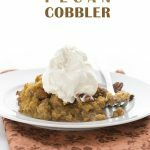 Can glucommannan or xanthan gum be used to thicken the pastry cream instead of cornstarch ? How much would you recommend? Yes, actually it can. Search my blog for pastry cream and you will see an updated recipe. This looks amazing!! I ruined my A1C number because I am addicted to Boston Cream Pie!! I am so happy you made this. I am going to try. Here is my question I never used Whey Protein before, what brand do you recommend? I hope I do not have any side effects? Also, I do not like Greek yogurt, do you think the sour cream would work? Oh and yes, sour cream should be fine. Hi again, can you tell me if I can use liquid egg whites in place of of whey protein? No, that would throw off your liquids. I had the same wonder! why pie if looks like a cake? It looks so delicious! You make me SO GLAD I’m eating keto now! This looks amazing! What a great idea! 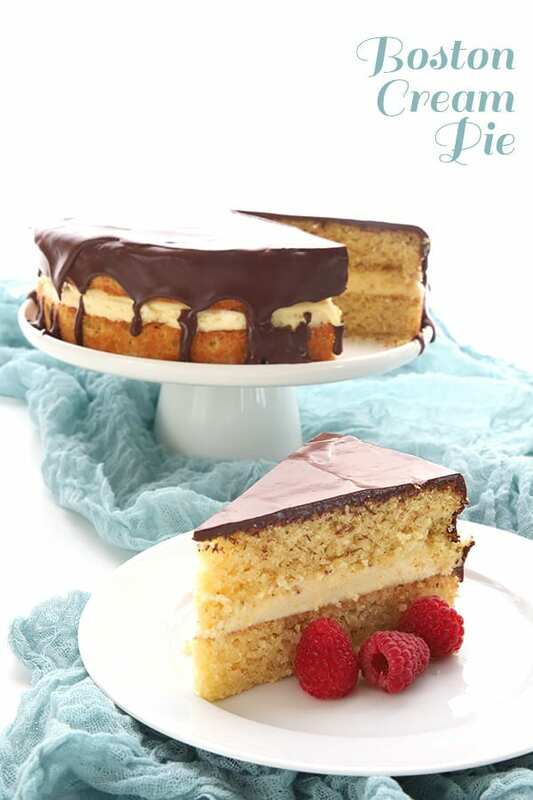 I love boston cream pie- and this is such a good alternative for those who can’t eat gluten! You are absolutely amazing! 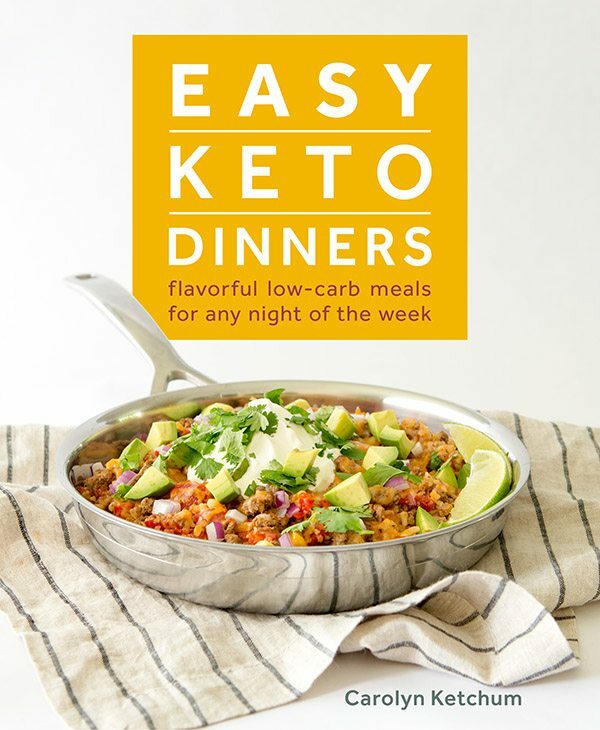 This low-carb version beats a full carb version any day! Looks delightful. I’ve stayed at The Parker House several times (where Boston Cream Pie originated) and always make a point to get some. Oh my this looks absolutely dreamy!! I need thi right now. I want a huge slice of this cake! So glad I don’t have to miss out on it anymore! Yum! My son loves Boston Cream anything but has been trying to watch what he is eating. Nice to have a low carb alternative to treat him with. What an amazing cake! It looks so moist and tender. Bonus points for being keto-friendly,too. I avoid Storrow Drive like the plague! LOL! Can’t wait to get home to try this recipe, I have missed a good Boston Cream Pie. I also miss Ricotta Pie from Market Basket, need to figure out a Keto recipe for it. I knew SOMEONE would get that reference… 🙂 Search this blog for Cannoli Tart and I think you will find something that will satisfy that Market Basket craving. I made this cake/pie yesterday and it is by far my family’s favorite keto dessert so far!!! Wow it was so much easier than I expected it to be (because it is so beautiful, you expect it to be hard!). the cake is tender and light….the pastry cream is, well, PERFECT….and the ganache…oh my goodness. You have outdone yourself with this update. I never tried the other one but I can sure speak for the updated version….it is AMAZING. Don’t forget your Boston Cream Poke Cake! It’s very similar, but a bit less work….and delicious! 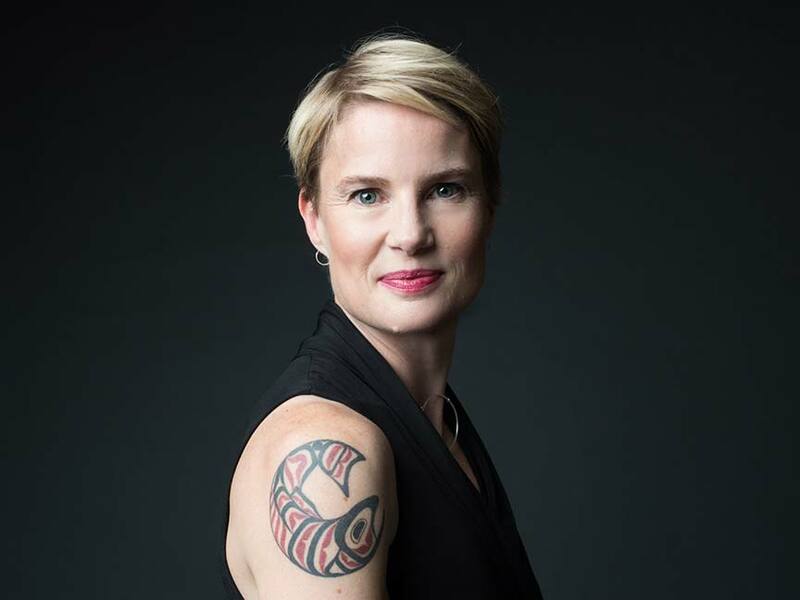 Carolyn, BRAVO! I made this years ago with the old recipe and it was good but this is great. Much easier to make wih ingredients that perform more consistently. I made it for a dinner party for me (celiac) and another guy who is diabetic. No one else knew it was sugar free. I love that! Thank you! It’s a keeper. I made this for Christmas and was very excited. The cream and the glaze turned out fabulous, but the texture of the cake made it taste like cornbread. Could it be the almond flour or was it over baked? I want to try it again. I am going to guess its’ your almond flour and that it’s more coarsely ground than good fine almond flour. This should be the texture of cake, not cornbread. Can I sub collagen or gelatin for the whey? If so, which one is best and would it be 1 to 1? I tried to google it but can’t find anything helpful. No you can’t, it makes cakes gummy and hard to cook through.